Saving water means not only saving money on your monthly water bills, but it means you are taking important steps to improve the health of the environment for yourself and generations to come. Most water-saving activities cost little or no money, instead they focus on changing our habits and the every day use of water in our homes. An article published by "EarthEasy" reports that 75 percent of the water used by an average household is used in the bathroom. A percentage like this is easy to bring down by incorporating just a few water-saving activities into your daily life. 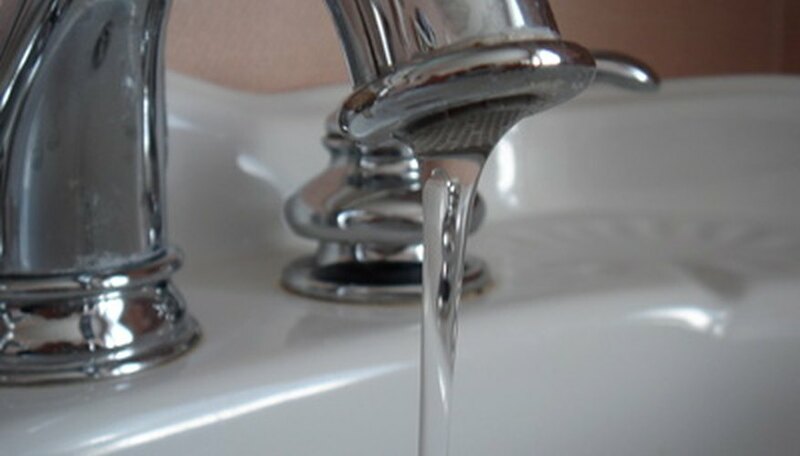 Check your home for slow leaks from faucets, toilet tanks and pipes. Wasted water can be detected if you check your water meter and then wait two hours without using any water at all. Check the meter again and see if it has changed. If the meter shows water use during those two hours you have a leak somewhere. Replace the washers in your faucets. Faucets that drip only one drop per second will waste 2,700 gallons a year. Water leaking out of your toilet tank and into the bowl is another water waster. Add a few drops of food coloring to the tank and do not use the toilet for 30 minutes. If there is color in the bowl after the 30 minutes, you have a leak. Replace worn out, bent or corroded parts. Replace or repair a toilet flush handle that sticks. Save hundreds of gallons of water a year by taking shorter showers and turning off the water while you wash dishes or brush your teeth. Don't use your toilet for a garbage can. Avoid putting tissues, insects or other items in the toilet; only flush when you need to. Run the dishwasher and washing machine only if you have a full load. Wash your vegetables and fruits in a bowl of water instead of under running water. Water your houseplants with the gray water. Start a kitchen compost pile instead of using the garbage disposal. Disposals require a lot of water use and according to the American Water and Energy Savers, and the solids disposals deposit in your septic tank can lead to maintenance problems. If you drink water from the tap, keep a container of water in the fridge instead of letting the tap run for your cool drink. Install low-flow fixtures in all of your bathrooms and flow restrictors on all of your household faucets. Replace your water-to-air air-conditioning system with a more effecient air-to-air model. Consider installing a tankless hot water heater. Tankless heaters produce hot water immediately, on demand and decrease the amount of time you have to wait for water from the faucet to run warm. Insulating your water pipes will help accomplish the same thing for standard water heaters. Plant drought-tolerant landscape plants in and around your yard. Install a drip system to minimize water use in the garden and apply adequate layers of mulch to keep the water from evaporating too quickly. Burns, Jo. "List of Activities to Save Water." Sciencing, https://sciencing.com/list-of-activities-to-save-water-12277475.html. 26 September 2017.